We don't just say we're the best - we make sure of it. Our electronics combine extensive knowledge of the industry with the demands of the players to create games that are simply unmatched in their technical engineering. You can be sure of one thing with Arachnid products . . .the uncompromising quality that comes with our name. Freestanding cabinet in Dark Cherry with routed doors and storage. Arcade Style Cabinet w/CricketPro 800 Electronic Game. DMI Soccer tables are available in a wide variety of sizes and colors. From our heavy duty models like this FD250DS with strong 5" legs to furniture finish models like the FT270, we have a table for every player. Goal-Flex Technology Hockey Table 7ft. set goal movement and size. This allows players to customize games for handicapping or adding exciting interactive features. As an extra benefit, since there are no goal slots, the puck never leaves the play surface, allowing for continuous, fast-paced play. 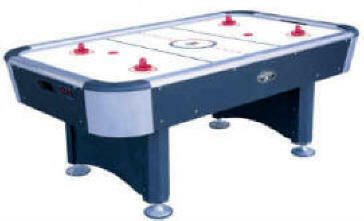 Goal-Flex Technology Hockey Table 8ft. The fully programmable computer inside the easy-to-use console unit is capable of running more than 180 game variations, so now players can program goals to change in size, move during play, even adjust for power plays! Goals can also split in two, allowing for 2-on-1, or 2-on-2 play.